The Model 15-400 RP Pressurized Consistometer is able to test cement slurries at temperatures up to 400°F/204°C and pressures as high as 15,000 psig/103 MPa. Designed to perform thickening time tests in accordance with API specification 10B-2/ISO 10426-2. The consistometer slurry cup assembly uses a rotating paddle and a stationary cylindrical slurry cup assembly. A solid heating/ cooling jacket surrounds the slurry cup where a sidewall thermocouple is used for determination of cement slurry temperature. The rotational force on the paddle is proportional to the consistency of the cement slurry and is measured through a servo drive computer. The consistency is indicated on a plot generated by the data acquisition system. Consistency values are recorded in Bearden units of consistency (Bc). The consistometer is equipped with a device for post-test cooling of the instrument. This is an external-cooling jacket attached to the pressure vessel. After completion of the test, cooling water may be circulated through this cooling jacket to cool the pressure vessel. provides unparalleled ease of use for the operator. Temperature control is programmed through the use of a touch screen monitor. A separate PC and keyboard/mouse are not required. A plot showing temperature, pressure and consistency may be plotted on any printer or shared through the computer. 15-400GS – Combined pressurized consistometer and static gel strength tester. maintain unit. The M15-400GS represents the easiest to operate and most reliable static gel strength tester in the industry. This additional software package is designed to perform static gel strength tests in accordance with API specification 10B-6/ISO 10426-6. The static gel strength of cement slurry is measured using a standard paddle and with the same configuration as a thickening time test. 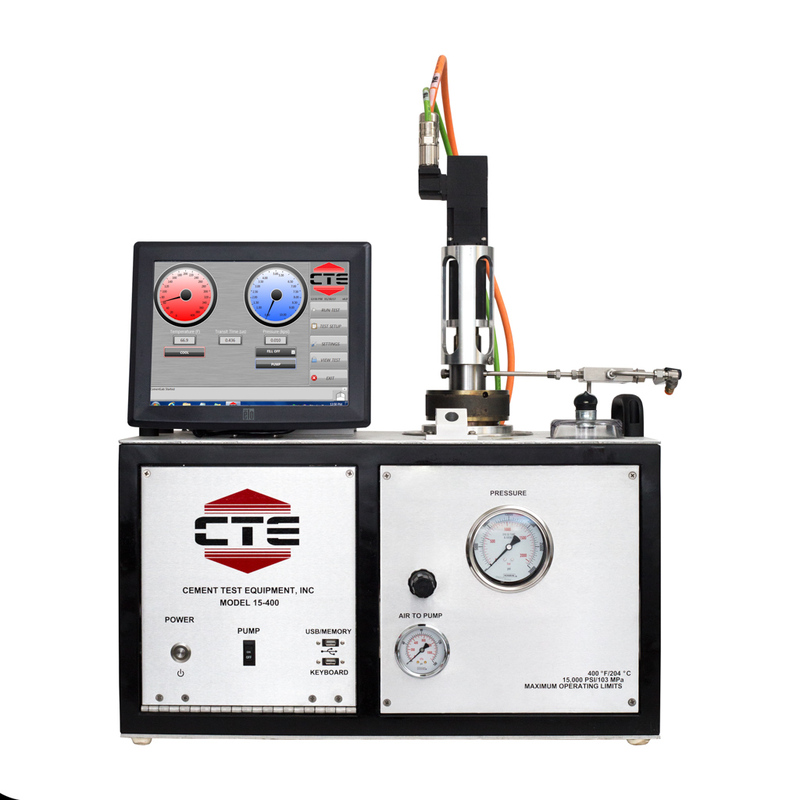 This makes transitioning from thickening time to static gel strength testing instantaneous, simulating real-world downhole conditions. The paddle is held in a virtually stationary position allowing for extremely precise direct measurement of static gel strength development in real time. The M15-400GS represents the new standard for static gel strength measurement and is backed by over 20 years of proven research and results. The portable combination of API thickening time tester and static gel strength determination make this an economical and powerful tool for any laboratory. Accurate gel strength readings from 100 –1000 lbf/100ft2. Fast, automatic cooling after test. Below-ambient temperature testing for low-temp wells. Windows 7 operating system with 180gb hard drive. Easy cement ejection system for less cleanup. Compact benchtop design with access doors for easy serviceability. Pressure, consistency and gel strength displayed in real time. Gel strength option can be added after purchase at any time. Easily export data into text files for import into any database or spreadsheet. Remote viewing capable via network. Improved magnetic drive system is more robust and longer lasting. Direct static gel strength measurement, no estimates. 12 inch color touch-screen for display of testing parameters and access to programmable features. Networked data acquisition in real time with remote viewing. Adjustable audible alarms for consistency & gel strength. Rugged electronics and plumbing are easily accessible. Fast computer processing speed and lots of on-board memory keeps your instrument running at it’s optimum. Many new and experienced users are more familiar with touch-screen computer technology. Thermocouple detection protects against run-away heater. Over-current sensing monitors and protects against shorts circuits. Rupture disc protects system overpressure. Fused circuitry protects system components. Replacement and consumable parts in-stock ready to ship worldwide. Heater Type: Cast heater with integrated cooling coils. This unit comes with spare o-rings, shafts, mineral oil, hoses and connectors to connect to your utilities, calibrator assembly with weights, fuses, SAE wrenches, multi-wrench, rupture disc, pre installed printer, power cord – ready for your area’s power plug.